These affordable football figure awards trophies are ideal for boys' football awards, youth football awards as well as player awards for senior teams and clubs. 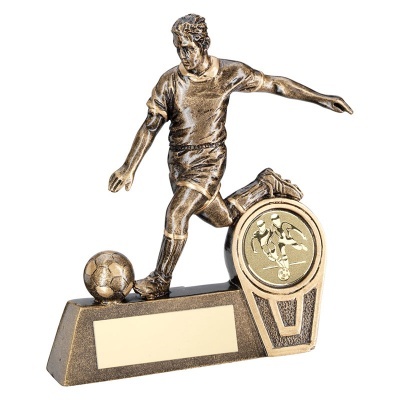 Created in durable resin, they feature a detailed figure of a (male) footballer in action and set on a bevelled base with a sloping front and engraving plaque. Alongside the footballer figure is a circular frame with laurel wreath garland border enclosing a 1in football theme centre. These value for money awards are available in three sizes and are offered with low, fixed-cost text engraving of the base plaque.